Car Seat Hanging Storage With Screen Pocket. Keep Stuff Off The Floor And Easily Accessible! Stuff Points: Earn 11 points when you buy this stuff. This high quality organizer is the perfect companion on any road trip, but it's also ideal for everyday commuting. Six different pockets provide room for all sorts of stuff, and the large one at the top has a clear front for use as a screen holder. A set of three smaller pouches at the center are perfect for beverages, stuffed animals, snacks and toys because anything you slip inside will be easily reachable by kids sitting in the back seat. At the base of this storage device, you'll find two large pouches that are perfect for frequently used supplies, extra clothes, spare shoes and more. They're positioned so that one is in front of the other, and the back pouch has a thick, solid front whereas the front one is made from mesh. Two straps keep it in place on any car seat, and they are easily adjustable to prevent movement. Simply pull to shrink or expand as necessary, then click together to secure to the seat. It's made from durable materials that will easily support all your clutter, as well as resist wear over time. Stop dealing with a messy backseat, but don't waste money on cheap products that don't last. Get this amazing organizer to instantly provide ample storage, right where you need it. Keep kids entertained on long journeys, give them a place to store their stuff after school, hold snacks and drinks when on the road, keep toys and diapers for baby, and so much more. This handy storage solution is incredibly versatile, and able to adapt to almost any situation. It will help to reduce clutter created by busy kids, and it will help to eliminate the likelihood that stuff will end up on the floor to get dirty or ruined. Simply slip your iPad in the top to let them watch movies on your tablet, and keep it protected thanks to the plastic cover, and the fact that it will be out of their hands. Top Quality. Thicker materials, sturdy straps, and superior construction ensure that this organizer is better than flimsy alternatives commonly found elsewhere. You can be sure that it will work well, and last a long time with regular use. Universal Fit. Car, truck, mini van, regular van, it doesn't matter. This will fit on virtually any front seat to give those in the backseat more storage space. Easy-To-Use. Just set the straps to the right length for your exact seat, and then secure in place with a couple of clicks. The durable buckles operate easily, and hold strong to keep it in place. Versatile. With a variety of pouches, you're sure to find one that holds anything you need to store. The combination of pocket sizes and styles gives you a multitude of options when organizing the clutter in your car. Large. With six pockets in total, it provides ample storage space for any situation. It's pretty big in overall size, and it will almost completely cover the back of your car seat in most cases. Entertaining. 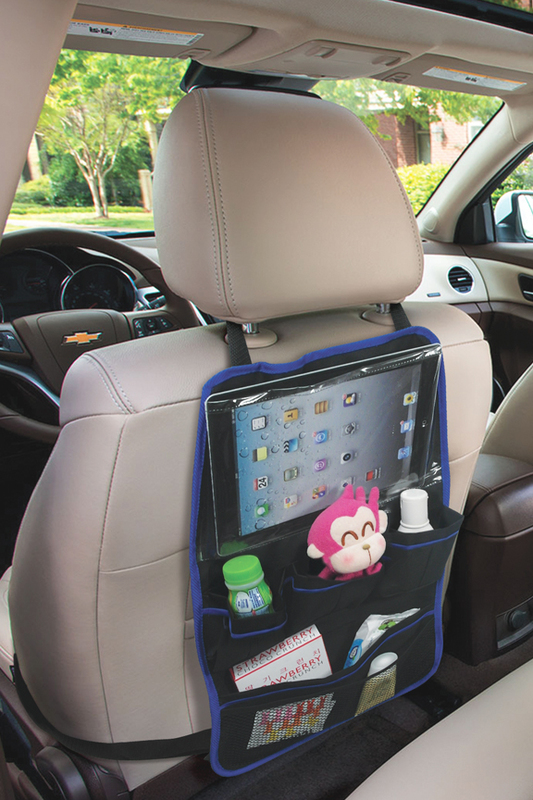 You could use the large pouch at the top for just about anything, but it's designed to hold tablets and other screens to allow kids to watch movies and videos while driving. Fully compatible with almost any vehicle, this storage device is simple to install. Once in place, it will provide the perfect solution to messy backseats full of toys, trash and food. Follow the instructions below to install in seconds, and ensure proper function. To prepare, unfold and lay flat. Check that the buckles are disengaged, and separate if necessary. There are two straps to secure it in place, one at the top, and one at the bottom. Place the top strap around the support for the headrest, and place the lower strap around the base of the seat at the lumbar location. To install, pull strap to lengthen or shorten as needed, then press the two sides of the buckle together until you hear a click. Repeat for the other strap, then check both, and tighten if necessary, and until secure. To remove, press with thumb and finger on both sides of the buckle to separate, and free it from the seat. Once installed, place items that fit into appropriate pouches. Hand or machine wash when necessary. Uses Attach to the back of your car seat to provide several pockets for storage. 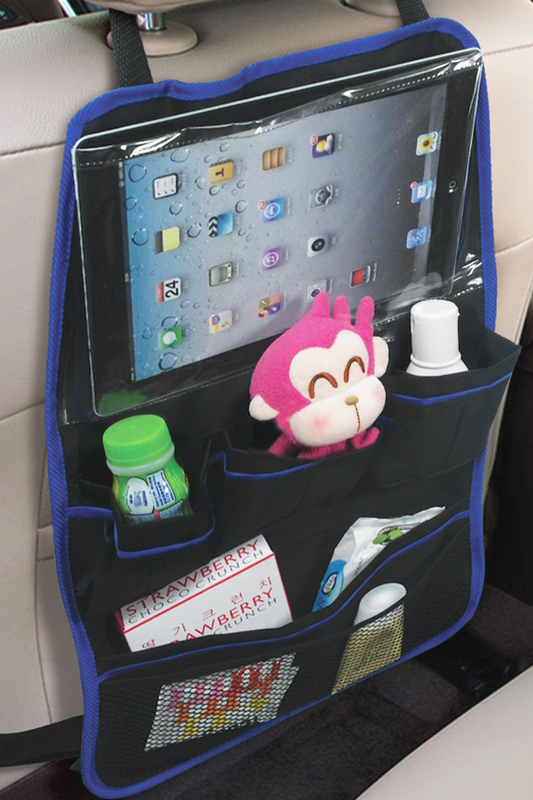 Use the large, see-through pouch at the top to hold a tablet or other screen so kids can watch. Keep snacks, beverages, stuffed animals and toys within reach and off the floor. Compatibility Works in any car, truck or van. Attachment Method Two straps (top and bottom) with buckles. Adjustable Yes. Tighten for a snug fit, and to prevent movement. Pocket Types (1) screen pocket with clear front, (3) small solid pockets, (1) wide pouch with solid front, and (1) wide pouch with mesh front. Keep your car clean, and give them access to the stuff they need. This handy item turns the back of any car seat into an organized storage caddy and screen holder in one. Keep kids entertained on long trips, and let them have toys and snacks within reach. Order Yours Today! A Universal Garment Hook For Your Car or Truck. Block Muddy Feet To Keep Your Car Looking Like New.